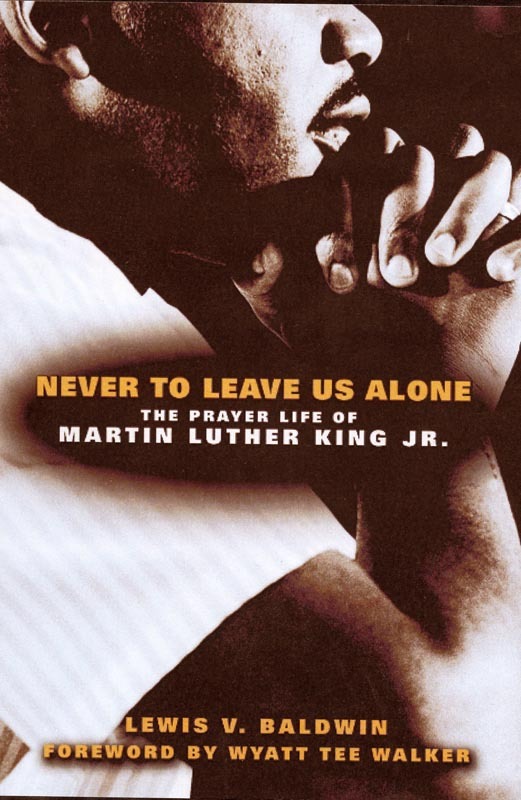 Never to Leave Us Alone: The Prayer Life of Martin Luther King Jr. Lewis V. Baldwin. Minneapolis: Fortress Press. 2010. 192 pages, softbound. $16.95. www.fortresspress.com. Martin Luther King, Jr., has become so iconic that he risks being seen as a man in his time even as he is ahead of his time. His legacy may sometimes, in fact, drown out just how human a person he was. Lewis V. Baldwin’s recent Never to Leave Us Alone: The Prayer Life of Martin Luther King Jr., brings the “bigger than life” and the “ever so human” aspects of King together in a way that can both challenge and inspire. Even as King developed his public voice as the primary spokesperson for America’s civil rights movement, it was clear that he was more comfortable with an inward journey of piety and prayer. And his clear rootedness in the African-American Christian experience is nowhere more obvious than in his prayer life, Baldwin demonstrates. Baldwin traces King’s prayer life from his early days in his father’s congregation, through his student days, to the challenging days of his public ministry. Whether interceding in tense situations or quoting the laments of well-recognized spirituals, King was expectant that his God answered those who asked. Without understanding King’s personal spiritual life, one cannot understand his activism. Never to Leave Us Alone offers a helpful glimpse into an under-appreciated aspect of King’s life.